We’re just about one month away from the official reveal of the Samsung Galaxy S10, but thanks to the rumor mill, we don’t have to wait until then to get an early peek at the upcoming flagship. 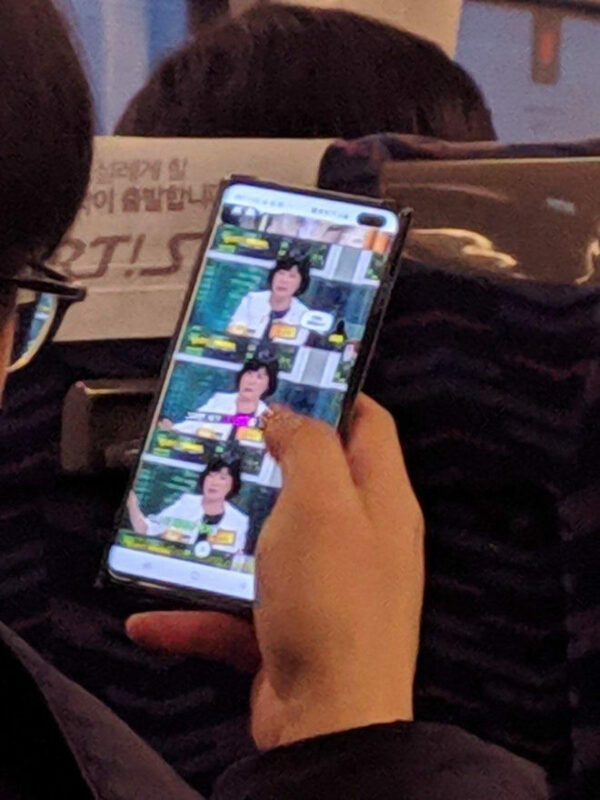 A photo of the Samsung Galaxy S10+ in the wild has been posted to Reddit. The image is a bit grainy, but we can see a hole-punch in the upper right corner of the screen with two front cameras, which means that we’re likely looking at the Plus model here. The standard Galaxy S10 model leaked earlier this month with a single camera in its hole-punch. We can also see rounded corners on this Galaxy S10+ display along with Samsung on-screen navigation buttons. Because the device is in a protective case, though, we can see much of the hardware design. Other rumored features of the Samsung Galaxy S10+ include a 6.4-inch screen, an in-display fingerprint sensor, and a Snapdragon 855 processor. Samsung is also said to be cooking up a standard Galaxy S10 model, a “Lite” version, and a special 5G edition. It’s possible that that 5G phone is the same 5G Samsung device that T-Mobile has confirmed is coming, but at the very least, it likely that the Galaxy S10 and Galaxy S10+ will make their way to T-Mobile. Now we just have to wait for February 20 to roll around to get all the details on the S10 from Samsung. What do you think of this leaked Samsung Galaxy S10+? Has Qualcomm made their chip for T-Mobile 5G yet? I think so, but an imtegrinte chip and modem for 5G won’t be til next year, this year the 5G modem is separate…. This looks better than the notch that everyone is following. Bet Apple going to copy this for next year. ha! Smartphones are used in our HANDS, not on desks, …..is there ever going to a point that people will say this is too big? I really think 5.7-6.1 is good enough. Just buy the smaller version. Problem solved. I’ll never get the reasoning behind a hole or notch, etc. All this freaking incredible technology and they don’t have the ability to get the camera under the screen without a problem yet? Why not a camera that pops out of the top of the phone, kind of like the sim card tray but automatically comes out when put in selfie mode and retracts when it’s not or the screen is turned off to avoid breakage? TBH losing a few millimeters on the whole top edge of the screen would be more preferable to me. there’s a phone that has that. I’ll be keeping my notchless Note 9 forever. They are too distracting. If you are going to have a notch or hole in the screen, then the screen size measurement should begin at the lower edge of that obstruction. By this method, the screen size is probably identical to the S9+. It’s not that it’s a bad design, but why bother making any visible screen area in the unusable portion around the camera? I would prefer the same format as the S8 and S9, but to each his own.